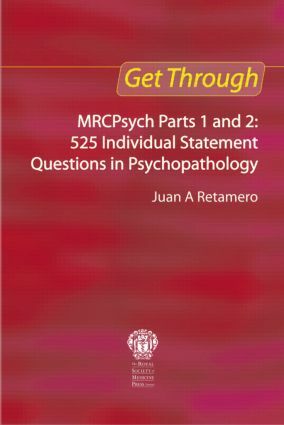 Forming part of the best selling and well respected Get Through series, Get Through MRCPsych Parts 1 & 2: 525 Individual Statement Questions in Psychopathology is an indispensable revision component. Psychopathology is one of the most frequent topics asked in the written components of both parts of the MRCPsych examination, making this title essential reading for any candidate undertaking the MRCPsych examination. Featuring 525 questions covering all aspects of the science of mental and behavioural disorders with all the answers supplemented with expanded explanations to help the learning process and containing ISQs covering all of the topics in the actual exam, this is one text that all candidates for the MRCPsych exam cannot be without. Recommended to all candidates preparing for the MRCPsych examinations, their trainers, qualified psychiatrists wishing to update their knowledge and for the junior doctor who may have just started psychiatric training.